When I was a kid, kites were just plain lame. They were generally made of two pieces of balsa wood with crappy tissue paper stapled to these to form the generic diamond-like shape. I'd put a tail on it, attach a line, run-dragging it down the street-until it became airborne. Then I'd have roughly 2 minutes of fun until the stupid thing would careen to the ground and splinter into a wad of wood and tissue. Wheeeeeee! Fun! Yeah... right. Shoot me. I would have more fun with a fresh bullet wound. Those of you who read the blog on a regular basis know that I'm a Star Wars junkie. 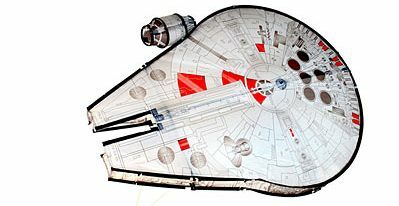 The moment I saw that I could purchase a Millennium Falcon kite I started drooling. This thing looks sooooo sweet! 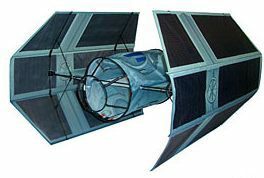 If you're not into kites that emulate YT-1300 freighters, you may find Darth Vader's TIE-fighter or Luke's X-Wing fighter more to your liking. I'm no engineer, so I'm clearly baffled as to how these kites, shaped as abstractly as they are, can actually fly. Or how they can get in the air at all, for that matter. 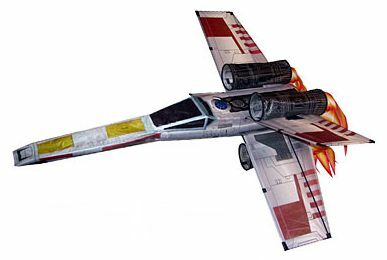 You can find the Star Wars Starfighter kites at ThinkGeek. For more way-cool Star Wars toys, go here. I can see why you can't easily understand how these "kites" fly -- in fact, they are terrible fiers. The last decade or so has saan an amazing explosion in kite design, as a quick web search will show you, and many very cool kite designs are out there. Many are more strangely shaped than these, whch are at least semi-aerodynamic shapes. These are just bad design that don't work.